Small-Flowered Sibbaldia is a white velvety herb, up to a foot tall. Leaves are odd- pinnate 3-4.5 cm long. Leaflets are 5-9 stalkless, their size decreasing downward from the terminal one, obovate-round, with 3-16 glandular tipped teeth or lobes along the margins, white velvety below, velvety above with short dark brown hairs. 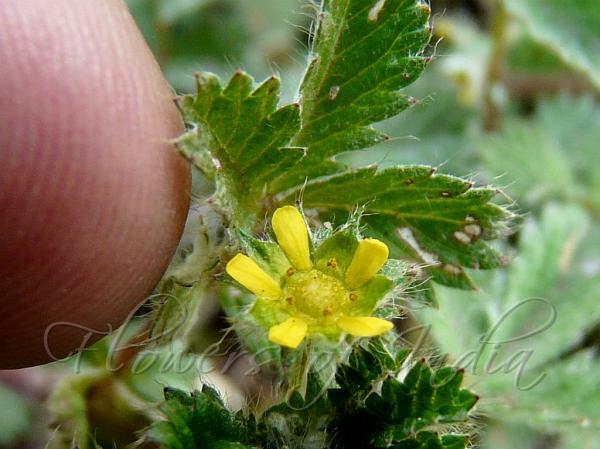 Flower arise singly, 4-8 mm in diameter. Sepals are long ovate, tip long-pointed. False sepals are elliptic-lanceshaped, slightly shorter than sepals, densely white velvety below, tip blunt or pointed. Petals are yellow or pale orange, oblong-lanceshaped, shorter than or equaling sepals, tip blunt. Stamens are 5, alternating with sepals; filaments short. Style is lateral. Achenes are brown, ovoid, partly glabrous and partly shallowly grooved. 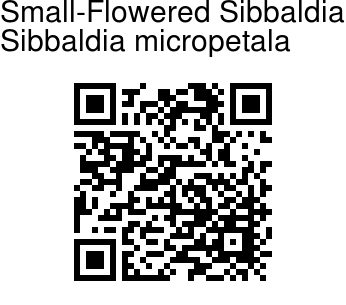 Small-Flowered Sibbaldia is found in the Himalayas, Kashmir to W. China, at altitudes of 3200-4000 m. Flowering: June-August. Photographed in Tawang distt, Arunachal Pradesh & Apharwat, Kashmir.